Hello? Is this thing on? Anybody out there? I seem to remember that, a long time ago, this used to be a place where we would write about some of our favorite recipes, including photos, instructions and maybe a little funny or interesting (to us) commentary. Now nearly two months after uprooting our entire lives starting a new adventure in Chicago, we hope to return this Internet space to all its former glory, and by “glory” I mean maybe one semi-decent recipe post per week, if we happen to get around to it. Although the current frigid temperatures here and around the country (keep it to yourselves, Hawaii and Southern California) don’t make for the most grill-friendly conditions, this lamb chop recipe is good enough to make us want to bundle up in a parka, clear a path through the snow and fire up the grill. The simple marinade made with basic ingredients of lemon zest and juice, olive oil, garlic, oregano and pepper yields surprisingly complex flavors when the lamb is grilled. If you’ve never cooked (or eaten) lamb before, this is a great introductory recipe because it’s so quick and easy, yet so delicious that it tastes like a fancy entree that took hours and hours to prepare. Start by combining the lemon juice and zest, olive oil, minced garlic, chopped fresh oregano (you can also use dried, just use about half as much) and freshly ground black pepper to make the marinade. 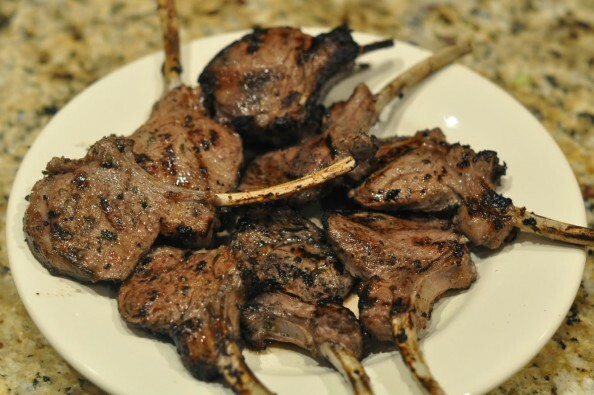 You can usually find lamb chops at the grocery store, often pre-packaged as a full rack of “frenched” lamb chops. “Frenched” means the ends of the bones have been cleaned, so you can use them as little handles. (Insert inappropriate, immature spin-the-bottle joke here.) Carefully slice between the bones to create individual chops. Place the chops in a resealable plastic bag, add the marinade and squish it all around to coat each chop (you’ve missed my precise and technical recipe instructions and descriptions, haven’t you? Me too). Marinate in the refrigerator for at least an hour. About 30 minutes before you plan to grill the chops, remove them from the fridge and the marinade (discard the leftover marinade), and allow the chops to rest at room temperature for half an hour. Just prior to grilling, season both sides of each chop with salt. Grill the chops over direct, medium-high heat until they are done. For us, “done” lamb means medium rare (still pink in the center). You probably don’t want to cook the lamb much beyond medium in terms of done-ness, or risk having it become tough and lose that “taste-the-cuteness” lamb flavor. On this night, we grilled the lamb for about 3 minutes on one side, rotating each chop about halfway through for good grill marks, then we turned the chops over and grilled the other side for another 3 minutes. While you’ve got the grill going, brown some pita bread for a couple of minutes per side. Allow the lamb chops to rest for about 5 minutes before serving. Serve with grilled pitas, tzatziki sauce and tabouli for a well-rounded Mediterranean meal. Speaking of well-rounded (and terribly obvious segues — you know you missed those too), it feels good to be back here making this food blog actually about food and sharing recipes with anyone? all of you! Combine all the ingredients other than the lamb and salt in a small bowl and stir them together for the marinade. Slice the lamb between the bones to create individual chops. Place the lamb in a resealable plastic bag, add the marinade to coat each chop. Marinate in the refrigerator for at least one hour. About 30 minutes prior to grilling, remove the chops from the marinade (discard marinade) and allow chops to rest at room temperature for half an hour. Just prior to grilling, season the chops on both sides with salt. Grill the lamb chops over direct, medium-high heat until they are done, turning them over halfway through the cooking time. For medium-rare chops, cook for about 3 minutes (rotate each chop halfway through the cooking time to create grill marks), then turn the chops over and cook for another 3 minutes. Grilling time will vary depending on the size of the chops and the heat of your grill. Welcome Back ! Great looking chops, maybe I can get your Mom to take a walk on the wild side and try them with me. Many thanks for the wonderful recipes! I read every post and have tried many of them, (the lamb chops most recently). I haven’t commented in a long time, but I am here and loving the food, the pictures and the narrative. Hi Mark! Thanks for hanging in with us, and for commenting! It’s nice to know you’re still following, and cooking! Hope you are well.
. (I would have said the nonsense of moving, etc., and but I couldn’t figure how to cross the word out. Lamb looks good too.